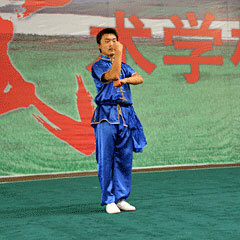 Easily-made errors: Chest is not thrown when holding fists. Correction: Raise your head and erect your chest and waist. Easily-made errors: Fail to push the palm upward to the appropriate place. Correction: Push your right palm upward all along and stop it when it is above the head. Easily-made errors: The right knee tends bend when making the bow step. Correction: Tighten your right knee backward. Easily-made errors: Weight is incorrectly laid in T-shaped bow stance. 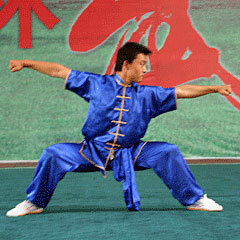 Correction: Lay your weight on the right leg when in T-shaped bow stance. Easily-made errors: The left palm is not pushed past the chest. Correction: The left palm has to be pushed forward across from the chest. Easily-made errors: The body waves when it turns. Correction: Keep your thighs apart horizontally when turning the body. Easily-made errors: Not forceful enough when pushing the palm. Correction: When you push the palm, make sure that the strength penetrates to the end of the palm in a fast and forceful way. 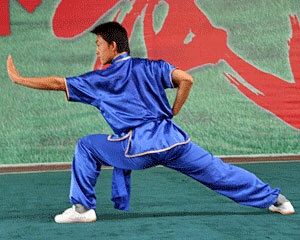 Easily-made errors: 1.Tiptoe tends to warp when the knee is raised. 2. Be too slow in slapping the foot. 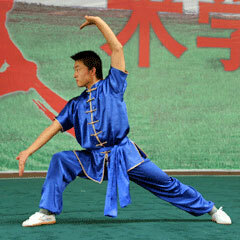 Correction: 1.When raising the knee, stretch the face of the foot with the tiptoe pointing at the ground. 2. Slap the feet with great speed and strength. Easily-made errors: Lean your body forward when putting down the right foot. Correction: Erect your waist backward when you punch the fist. Easily-made errors: The head is not swung to the appropriate place. Correction: Align your chin with the shoulder. Easily-made errors: 1. Fail to make a high snap kick. 2. The bow stance is not standard. Correction: 1. 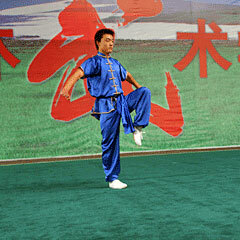 When doing the snap kick, maker sure the leg is higher than your shoulder and directed to the left ear. 2. 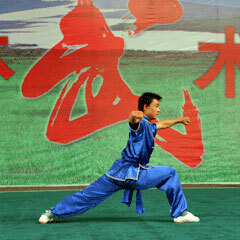 Make a half squat with the left leg horizontally to form the standard bow stance. Easily-made errors: 1. The sole is away from the ground when doing the crouch step. 2. Draw in the chest and shoulders when blocking the palm. Correction: 1. 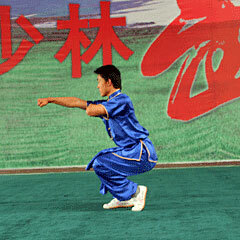 When doing the crouch step, extend your right leg with the toe turned inward and the sole stuck to the ground. 2. Stretch you shoulders when blocking the palm. Easily-made errors: 1. Rotating hands and stepping forward can’t be done coherently. 2. Shoulders tend to be drawn in when punching the fist. Correction: 1. Step forward first and then rotate the hand. Watch the turn. 2. Relax your shoulders when punching the fist. 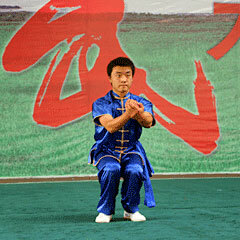 Easily-made errors: The feet are not in the right position to form the horse-riding stance. Correction: When forming the horse-riding stance, make sure the toes are pointed forward and the left leg is laid horizontally. Easily-made errors: The foot is clung to the ground when forming the T-shaped step. 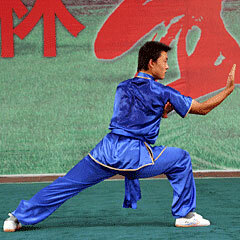 Correction: When making the T-shaped stance, extend your left foot with the toe touching the ground. Easily-made errors: Not coherent in motion. Correction: Be coherent and forceful. Easily-made errors: 1.The waist is bent when spinning. 2. It’s easy to stumble. Correction: 1. Erect the waist when doing the spinning motion. 2. 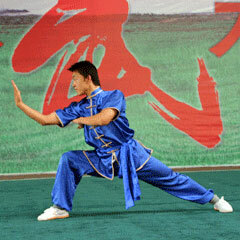 Stamp and strike the fist after the body is turned to the very place. Easily-made errors: 1. The leg is not swung high enough. 2. Pull in the chest and shoulders when blocking the palm overhead. Correction: 1. Swing the leg first and then turn the body. 2. Stretch the shoulders backward when blocking the palm. Correction: The left palm must be pushed ahead across from the chest. Easily-made errors: Hold the palm in an incorrect posture. Correction: Lower your elbows when holding the palm. Easily-made errors: Bend the left knee. Correction: Straighten the left knee. Correction: The left palm must be pushed forward across from the chest. 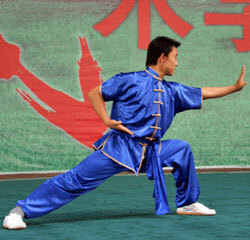 Easily-made errors: Fail to raise the knee correctly. Correction: Straighten the upper face of the foot with the toe pointing at the ground. Easily-made errors: 1. Unable to make a high snap kick. 2. Fail to point the tip of the elbow straight ahead. Correction: 1. 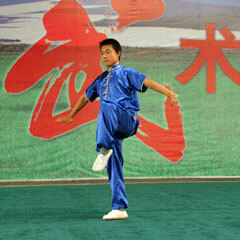 Make sure the leg is kicked in the direction of the left ear and is higher than the shoulders when doing the snap kick. 2. Ensure the tip of the elbow is in line with the right knee. Easily-made errors: 1. Unable to kick high. 2. The tip of the elbow is not pointed straight ahead. Correction: 1. 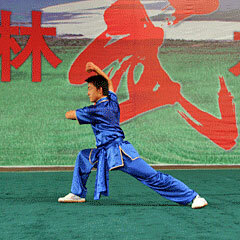 Make sure the leg is kicked higher than the shoulders and in the left ear’s direction. 2. The tip of the elbow is in line with the right knee. Easily-made errors: 1. The sole is away from the ground. 2. 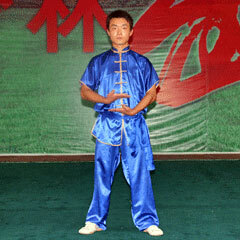 Draw in the chest and shoulders when setting the palm. Correction: 1. Extend your right leg with the toes pointing inward and the sole touching the ground when doing the crouch step. 2. Stretch your shoulders when setting the palm. Essentials: Step your left foot forward. Circle curves overhead with your left hand, palm upward. Transform your right palm into fist and hold it at the waist. Lift your right foot and step forward. 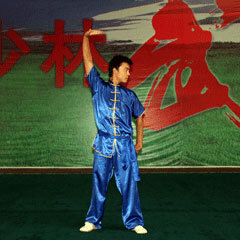 Transform the right fist into palm and circle curves over head. Transform the left palm into fist and hold it at the waist. Turn your body leftward 180 degrees. 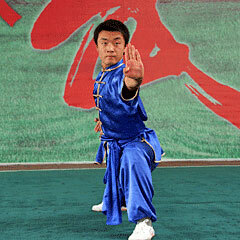 Lift your left foot and step forward, then put it beside the right foot to make a T-shaped stance. Transform the right palm into fist and punch both fists ahead simultaneously, bending the knees to the level of half squat. Look in the direction of the right fist (picture omitted). Easily-made errors: 1. Circling hands and stepping forward can’t be done coherently. 2. Shoulders tend to be drawn in when punching the fist. Correction: 1. 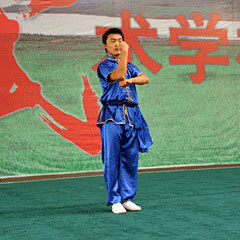 Doing stepping and circling hands simultaneously. 2. Relax your shoulders when punching the fist. Easily-made errors: The feet are incorrectly placed when making the horse-riding stance. 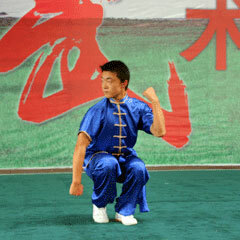 Correction: The toes are pointing forward and the thighs are horizontal when forming the horse-riding stance. 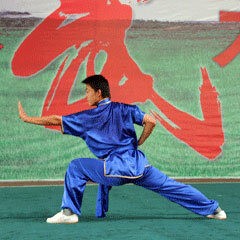 Easily-made errors: The sole is stuck to the ground when forming the T-shaped stance. Correction: Stretch the left foot tightly with the toe touching the ground when forming the T-shaped stance. 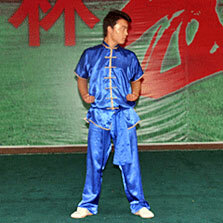 Easily-made errors: Fail to be coherent in motions and tend to draw in the waist. Correction: Be coherent. 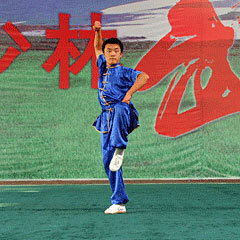 Erect your waist backward forcefully when kicking. Easily-made errors: Fail to turn your body to the exact position when doing the double palms pushing. 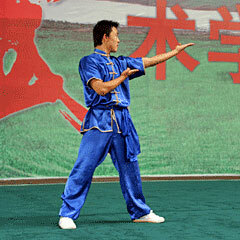 Correction: Push your palms straight ahead after turning the body. 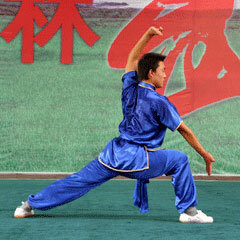 Easily-made errors: Be unable to make a standard bow stance. 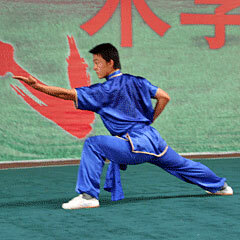 Correction: When making the bow stance, extend the left leg and squat to the level of 90 degrees on the right leg, the sole stuck to the ground. Easily-made errors: Fail to be coherent in motion and draw in shoulders and chest when setting the palm. Correction: Be coherent and stretch your shoulders when setting the palm. Easily-made errors: The sole is stuck to the ground when making the T-shaped stance. 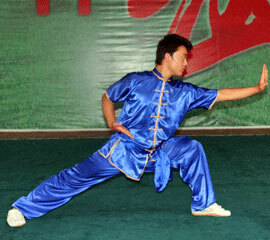 Correction: Stretch the left foot tightly with the toe touching the ground. 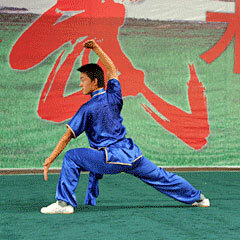 Easily-made errors: Fail to form a standard bow stance. Correction: Squat partly on the left leg at 90 degrees. Stretch the right leg with the sole sticking to the ground. Easily-made errors: Fail to hit palms forcefully. Correction: Hit the palms forcefully in front of the chest. 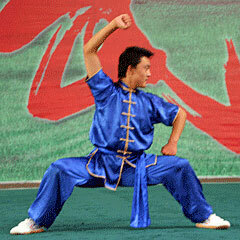 Easily-made errors: Fail to make a standard horse-riding stance with legs squatted not low enough. Correction: When making the horse-riding stance, make sure the feet are in line , toes pointing forward and being parallel with the thighs.